Crepe-like flowers appear from late spring onwards and are followed by the distinctive poppy head in which the seeds are stored. The milky juice obtained from this has narcotic properties, though less so than the white poppy from which opium is obtained. Poppies do not transplant easily. Better to start with seeds, in pots in the northern climates. Grows wild in cornfields, hence its common name ‘corn poppy’. Mostly cultivated. In classical mythology this plant was sacred to Ceres. 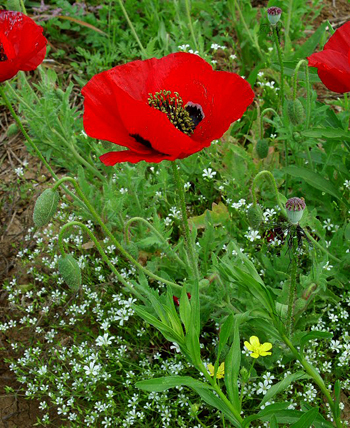 The Red Poppy has a long honored reputation as a sedative. It contains a non-poisonous sedative alkaloid called rhoeadine. But, unlike its cousin the “Opium Poppy”, it contains no narcotics. The blossoms and seeds are also added to cough syrups. The flowers are used as a dye in teas, wine and ink. Leaves and petals are used in a standard infusion on sore throats, cough, and chest congestion, catarrh, hay fever, asthma, dyspepsia, diarrhea, dysentery, insomnia, nerve pain, and other respiratory complaints. A few crushed poppy heads added to a linseed poultice (1/4 lb. linseed, 1/2 oz. olive oil, both well stirred in one pint of boiling water) will reduce pain and swelling. Poppy seed used as topping on cookies, breads, rolls; in cake fillings, fruit salads, canapés, and sweet vegetables. (These poppy seeds are not from the opium poppy, Papaver somniferum L.). Decoction: 1/4 oz. of poppy seeds simmered in 1 pint of water along with 1 tsp. each of nutmeg and ginger powder and taken 3 times a day immediately after meals for nervous digestion. A cup also taken before sleep to promote rest. Caution should be taken in cases of gastritis and colitis.